Starring: Severa Mukakinani, Odette Mukakabera, Chantal Kantanga, Joseline Mujawamariya, Delphine Umutesi, Mary “Fifi” Mukangoga, and Marie Chantal Akimana. In the wake of the Rwandan genocide, the country’s population was left nearly 70% female. Rwandan women were handed an extraordinary burden and an unprecedented opportunity. “God Sleeps in Rwanda” follows the stories of five Rwandan women as they rebuild their lives and communities after the massacres of 1994. Severa Mukakinani, Odette Mukakabera, Chantal Kantanga, Joseline Mujawamariya and Delphine Umutesi tell their stories of new found empowerment, becoming leaders, police officers, politicians, AIDS activists and landowners. Despite the psychological and sociological traumas of the genocide remaining, the documentary shows how the strong surviving spirit of Rwandan women is changing the cultural landscape to create a better Rwanda. 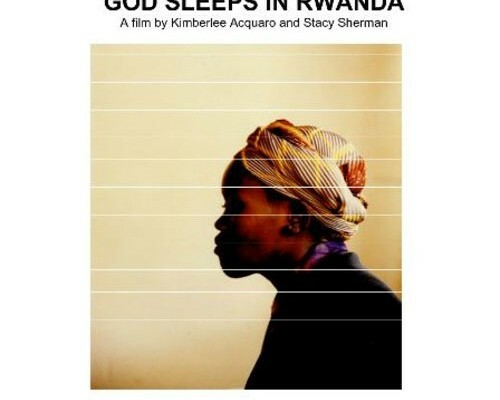 “‘God Sleeps in Rwanda’ Nominated for Oscar.” News & Notes from NPR, 3 March 2006 https://www.npr.org/templates/story/story.php?storyId=5243604.